On 16 May 2013, at the invitation of Jörg Resch and after my lecture in 2010, I was once again guest at the European Identity Conference to talk about the Venetian model of anonymity. – Bauta and Tabarro are historically rooted in the traditional carnival and in the role-playing games of the Commedia dell’Arte. The Venetians knew both and were used to them. – Using the mask as a means of anonymization meant a thoughtful act: one had to “disguise” oneself skilfully, which cost a little effort and time. Wearing the mask meant playing hide and seek and attracting attention at the same time. – Taking on the role of the “ideal Venetian citizen” also meant accepting the behaviour of a gentleman. – Venetians who communicated with a bearer of the Bauta could trust that he or she accepted his special political and social role and, in terms of behavior, adhered to the rules of this special kind of game. – Immediate sanctions were possible in the event of abuse. – To use the Bauta therefore meant consciously accepting social control and social expectations. It also meant accepting a possible unmasking, a related loss of honour and immediate exclusion from the Venetian community as a sanction for abuse of the privileges offered by the mask and disguise. – Thus, the mask had a direct and inevitable influence on the behavior of those who used it. In the discussion that followed the presentation, the audience was showing interest in the underlying reputation and sanction system of the anonymity model. An ordinary “reward system” does not exist, as the expected behaviour of a masked person was simply “normal” from the point of view of the Venetians. Social pressure, however, did exist as a corrective, and the participants found it interesting that the punishment for misconduct immediately threw the delinquent back into his real, non-anonymous existence and had consequences there. On the other hand, unmasking a Venetian did not rule out the possibility that the same person later would take part in the anonymous life again, provided he was not sent to prison. Related to anonymous life, a purely behavior-based security existed. This model, the listeners agreed, could be transferred to anonymous platforms on the Internet: Those who behave badly should be simply excluded from those places immediately. If the new registration process is only laborious enough, the pure inconvenience of the sanction could possibly effectively ensure good behaviour. Note: This blog entry was translated from the German original with the help of artificial intelligence. It’s not perfect, for sure. Please excuse me for any imperfections. It was in April 2013 when I finally had a chance to visit Venice again. My beloved wife and I strolled along the narrow streets, and of course we had a look at the display windows of the mask makers. And there we found: Guy Fawkes! 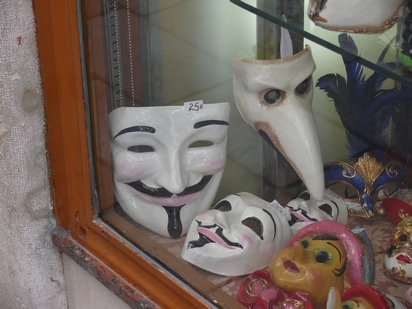 The Venetians produce the mask in their traditional way, and somehow their version looks friendlier than the well-know plastic masks which are based on the comic “V for Vendetta” and the film version. Just a joke for the tourists? Maybe. But it is an intriguing phenomenon: In modern Western civilizations, the Guy Fawkes mask is perhaps the one with the highest impact on culture and political life, and it stands for privacy and the right to act anonymously. And now it has found its way back into a a cultural environment which in the past used probably the most elaborated anonymity concept in daily life and for political purposes. 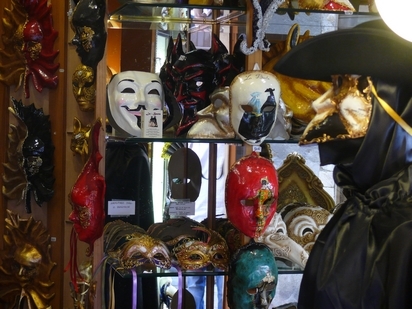 Joerg Resch, Co-Founder and Managing Director, KuppingerCole, presented the Venetian anonymity concept at a biometric spoofing workshop in Rome on May 11th, 2012. He decribed the Bauta as an example of a trust framework following perfectly the principle of minimal disclosure through anonymity and compared it with modern trust framework models. Prof. Dr. Kesdogan, Head of Research Group at the Business Informatics Chair at Siegen University, invited me to hold a presentation on the Venetian anonymity concept on Frebruary 23rd, 2012. The presentation took place and perhaps leads to an official research project. Teachers and students were especially interested in how to use elements of the Venetion concept to design models of anonymous participation in organizational and political, perhaps municipal decision making processes. How does the Bauta concept of anonymity comply with well-known social and philosophical concepts of public and private life? How do anonymity concepts for closed online communities differ from those for the internet on the whole? How does the Bauta concept fit in? Is the “internet netiquette” idea something which can be compared to the “gentleman factor” of the use of the Bauta? A pseudonym (literally, “false name”) is a name that a person (or, sometimes, a group) assumes for a particular purpose and that differs from his or her original orthonym (or “true name”) (Wikipedia). Anonymity is derived from the Greek word ἀνωνυμία, anonymia, meaning “without a name” or “namelessness”. In colloquial use, anonymity typically refers to the state of an individual’s personal identity, or personally identifiable information, being publicly unknown (Wikipedia). So what’s the Bauta? An anonymity or pseudonymity device? From my point of views, assuming a predefined and generic role like the one of Signora Maschera means staying anonymous. Jillian C. York is director of International Freedom of Expression at the US organization Electronic Frontier Foundation. Some of her articles and a lot of the interviews she has given provide excellent insights into chances and problems of anonymity and pseudonymity on the internet and on closed social network platforms. “A case for pseudonyms” for example explains why being able to use a pseudonym sometimes saves one’s life and often is an important factor to guarantee freedom of speech. “Lieber anonym als verfolgt” partly is a German translation published in the weekly newspaper “Die Zeit”. In “San Francisco Organization Fights For Online Anonymity” by CBS San Francisco Jillian C. York briefly summarizes why she does not like the ban of user pseudonyms by Google+ and Facebook. This is the second approach to launch Licence to Mask, as the first site was hacked in July 2011. From August 2011, step by step the existing content was filled in again. Additionaly, Licence to Mask this time has a German version, too. Rebuilding the website started August 12th 2011. Since January 6th 2012 it's up and running again. Time for new Posts!